The Minnesota North Stars were a professional ice hockey team in the National Hockey League between 1967 and 1993. In the fall of 1993, the franchise moved to Dallas, Texas, where it is now known as the Dallas Stars. 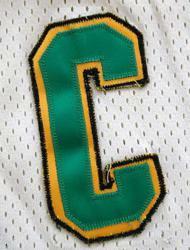 The team's colors (for most of their history) were kelly green, gold and white. In the 1967-1968 season the NHL expanded from its long-time base of six teams (that is commonly referred to as the Original 6 era) to twelve teams. Minnesota was a well-known hockey hotbed and was a natural site for a franchise. The Minnesota North Stars played their home games in the new Metropolitan Sports Center in Bloomington, Minnesota. 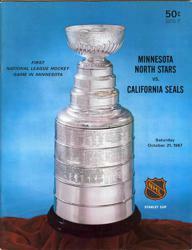 The first NHL game in Minnesota was played on Saturday Oct. 21st 1967 against the California Seals. Behind a skilled management team, the North Stars had respectable success in the early years, prospering behind goaltending duo Lorne "Gump" Worsley and Cesare Maniago. Defenseman Ted Harris was the North Stars captain. The first Stars team also included high-scoring winger Bill Goldsworthy and other quality players such as Barry Gibbs, Jude Drouin, J.P. Parise, Danny Grant and Dennis Hextall. 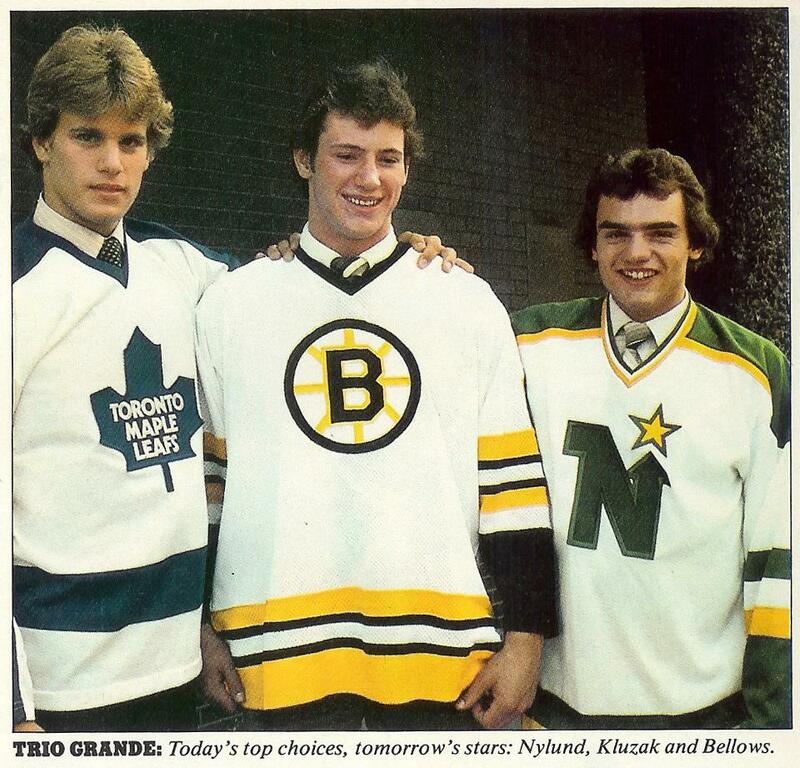 Early in their first season the North Stars suffered a terrible tragedy. On January 13, 1968, forward Bill Masterton suffered a fatal hit during a game against the Oakland Seals. After getting hit by Seals forward Ron Harris, Masterton (who was not wearing a helmet) fell backwards, hitting the back of his head on the ice. He never regained consciousness and died on January 15, 1968, at the age of 29, two days after the accident. To date, this remains the first and only death in NHL history resulting from an on-ice injury. The North Stars retired his jersey, and later that year hockey writers established the Bill Masterton Memorial Trophy which would be given annually to a player who best exemplifies the qualities of perseverance, sportsmanship and dedication to hockey. By the mid-1970s, with Worsley and Harris retired, the North Stars had fallen on hard times, perennially attaining poor records and usually finishing out of the playoffs. However, in 1978, the struggling team was bought by Gordon and George Gund, the owners of the Cleveland Barons franchise, who were permitted to merge the two teams in an unprecedented arrangement. A few skilled players – notably goaltender Gilles Meloche and forwards Al MacAdam and Mike Fidler – bolstered the Minnesota lineup. Furthermore, Minnesota had drafted Bobby Smith, who would go on to win the Calder Trophy that year. With the additions of fine new players such as Minnesota native and ex-1980 Olympian Neal Broten and sniper Dino Ciccarelli, the North Stars had five straight winning seasons starting in 1979-80 and reached the Stanley Cup Finals in 1980-81. 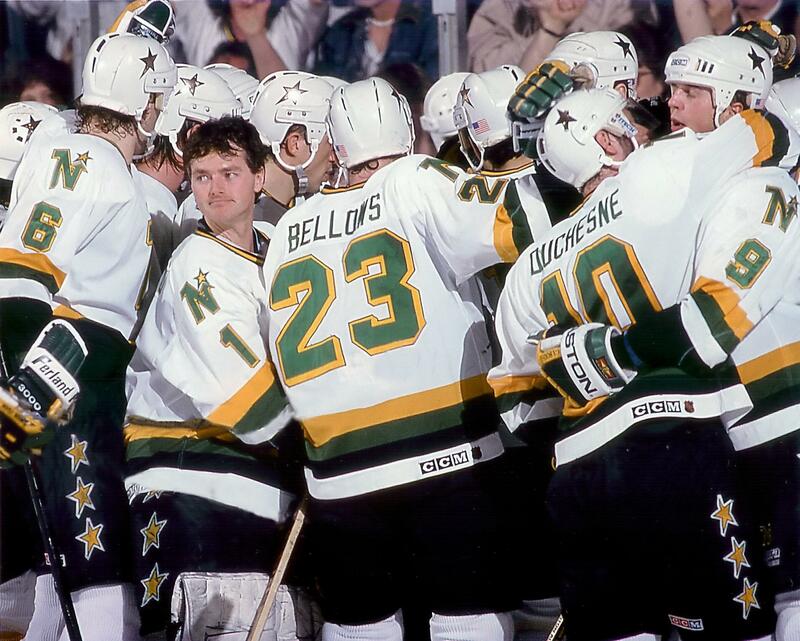 Before the move to Dallas and thereafter, success again eluded the North Stars. After 1984 the franchise would only have one more winning season in Minnesota before the move to Dallas. 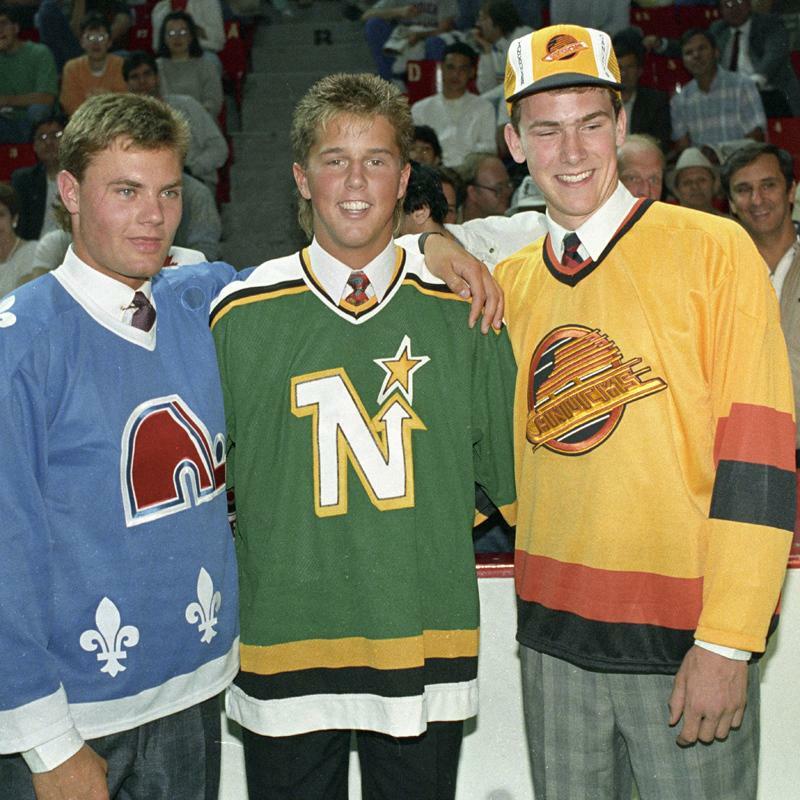 While the late 1980s saw the franchise draft what would turn out to be their greatest player – forward Mike Modano – chronic attendance problems spurred the owners to threaten to move the club to the San Francisco Bay Area, against the league's wishes. A compromise was implemented for the 1990-91 season whereby the Gund brothers were awarded an expansion team in the Bay Area, the San Jose Sharks, that would receive players via a dispersal draft with the North Stars. A group previously petitioning for an NHL team in the Bay Area led by Howard Baldwin and Morris Belzberg bought the North Stars as part of the deal. Baldwin and Belzberg purchased the team from the Gund brothers for approximately $38.1 million (including $1 million in liabilities as well as giving the Gunds their share of the fees from the next three expansion teams, expected to be $7.14 million). Norman Green, a last-minute newcomer to Baldwin and Belzberg's group, purchased 51% controlling interest in the North Stars from them, with Baldwin and Belzberg sharing the remaining 49% stake in the team. Green agreed to purchase Baldwin's 24.5% share, giving him more than 75% control of the team, shortly after a dispute with Baldwin arose. Belzberg maintained his share of the rest of the team's stock until October 1990, when Green became the sole owner by buying Belzberg's shares. In that 1991 season, despite a losing record in the regular season, the North Stars made it to the 1991 Stanley Cup Finals. They knocked off the Chicago Blackhawks and St. Louis Blues (the top two teams in the NHL during the regular season) in six games each and the defending Stanley Cup Champion Edmonton Oilers in five games. The team fought hard against the eventual champion Pittsburgh Penguins, led by Mario Lemieux. They won two out of the first three contests before being obliterated 8-0 in Game 6 of the best-of-seven series. It was the most one-sided defeat in a deciding game of the Stanley Cup Finals since the Ottawa Silver Seven defeated the Dawson City Nuggets 23-2 in 1905. The shocking loss seemed to let the air out of the franchise for good. Green's mercurial personality and mounting financial and legal problems also began to grate on the area's fan base, and local support for the franchise rapidly dwindled. Finally, with his northern mall empire threatening to fall into receivership and a sexual harassment lawsuit against him working its way through the Minnesota court system, Green demanded concessions for his team that the area and state were unwilling to give, so he moved the team to Dallas, Texas, in the fall of 1993. When the Dallas Stars won the 1999 Stanley Cup, their official video "Nothing Else Matters" not only included their past seasons' disappointments, but also paid tribute to the North Stars' 1991 run to the final, of which star Mike Modano, team captain Derian Hatcher, and general manager Bob Gainey had been part. In the next wave of NHL expansion the Twin Cities were granted a new franchise, the Minnesota Wild, which began play in the 2000-01 season. This is a list of players who have played at least one game for the Minnesota North Stars of the National Hockey League (NHL). This list does not include players for the Dallas Stars, Oakland Seals, California (Golden) Seals, and Cleveland Barons, which are teams that previously held this franchise.